I’m reading The Know-It-All, A.J. Jacobs’ book detailing his experience reading the whole 2002 edition of the Encyclopeadia Britannica, and it gave me an idea. Maybe I could document my journey through a difficult book too. The first that comes to mind is Molecular Biology of the Cell, a technical but fascinating and well-written molecular biology textbook. I want to better understand how life works, and it seems like a good place to start. 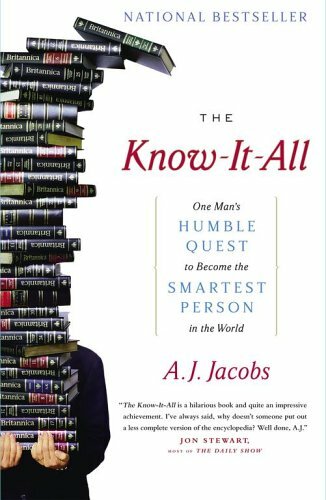 I don’t think I could make it as entertaining as Jacobs’ book, but it might motivate some people to learn some biology in the same way that the Know-It-All makes me want to pick up an encyclopedia. This project needs more thought before I commit to it. Molecular Biology of the Cell is an intimidating book, all 1,268 pages of it… Far from Britannica’s 34,000 pages, but hey, this is hard science! Figuring out a structure wouldn’t be quite as straightforward as mixing up historical trivia and personal anecdotes the way Jacobs does. Maybe I just won’t find a way to make it work — Encyclopedias offer bite-sized info while textbooks are more linear and constantly build on top of what came before, making it hard to skip over or isolate parts. Pros: Even if I can’t make it all the way through, I’m sure I’d get something out of it, if only better retention of what I read. Cons: I’m not exactly good at sticking to reading plans. My interests tend to be all over the place and go through phases (I’ll read a book on economics, then on WWII German generals, then on neuroscience, etc). But even if I read other books in parallels and sometimes pause because I’m too busy with other things, this could be a long-term, open-ended project. This entry was posted on January 22, 2008 at 4:05 am and is filed under Books, Science & Technology, Thoughts. You can follow any responses to this entry through the RSS 2.0 feed. You can leave a response, or trackback from your own site.